In 1875 Bree wrote: “In all parts of Italy this species is met with; but while it is only a bird of passage and rather rare in the northern parts, in the central and southern parts it is common, and passes the winter there. In Sicily and in Malta it is the most common species in that season”. In 2014 (140 years later) this is the status: Regarded as very common in the early 19th century, it was already a rare bird by the 20th century, with regular records having dried up by the end of the century. In 1994, the population was estimated at only 50-270 individuals, but the paucity of recent confirmed records suggests it may now be lower than 50 birds. What happened? We simply don’t know, the breeding grounds are unknown and wintering grounds are hardly known. It is notoriously hard to recognize between Curlews and Whimbrels, it is a very complex species to protect. Threats on the breeding grounds are unknown. Habitat loss in the wintering grounds is of unknown importance. Historically hunting was high, and may have been the key factor in its decline. Following the initial decline, breakdown of social behaviour patterns may have prevented recovery. It is a gregarious species, small groups may have difficulty in locating suitable stop-over sites on migration. Individuals may join flocks of N. arquata, being led to unsuitable wintering habitat and rendered unlikely to find a mate. It could be present in countries such as Iraq and Iran, which have been hard to visit for obvious reasons. Bree in 1875 wrote: “They live sometimes in the neighbourhood of running water, at others in that of stagnant water, but they rarely frequent the shores of the sea. It is worthy of notice that the flocks daily leave the water to spread themselves out among meadows and uncultivated fields, where they remain until they are obliged to return to the water, without which they could not live, as they drink a great deal, and frequently bathe. They are very shy. Their flesh is esteemed in Italy as a delicacy. Thorburn in 1915 wrote: “The present species inhabits fenlands, either such as are open or such as are covered with birch trees, or sometimes marshes adjoining the pine forests. Its nest is placed on a large hillock, or on a small dry island, often on one ten to fifteen yards square. Mr. Ushakov always found it nesting in single pairs, and often side by side with Numenius arquata, but he was informed by local sportsmen that it also breeds in colonies of several dozen pairs. The nest is a mere depression in the ground, not more than an inch deep, scantily lined with dry grass, or sometimes with a low border of dry grass, in which case the nest takes the form of a somewhat deep cup. Why did it disappear? We, at planetofbirds.com think it is a similar story to the Spoon-billed Sandpiper. This historically less common species is better known in its breeding and migration habitat but also suffered an extremely steep decline. Their breeding habitat was discovered relatively late in the 20th century as that of the Slender-billed Curlew. It also migrates thousands of kilometers, using the same stop-overs annually and visits similar coastal, wet habitat. During migration it is threatened by the diminishing of suitable feeding grounds and the drainage of the wintering grounds. Every birder who (like us) has visited a South-Central European country during hunting season, knows the devastating combination of hunters, dogs, guns and alcohol. A major threat to every species, but more so to a species with little genetic differentation. Another reason which is regularly mentioned is the breakdown of social structure. The species is not able to find suitable stop-overs in small numbers. Being gregarious, the joining of common Curlew flocks might result in visiting unsuitable feeding ground or finding a mate. The breeding grounds of the Slender-billed Curlew, a ground colony breeder, may well be scavenged by feral animals as civilization approaches the area. Also nearby human settlements may have introduced different predators in the area. 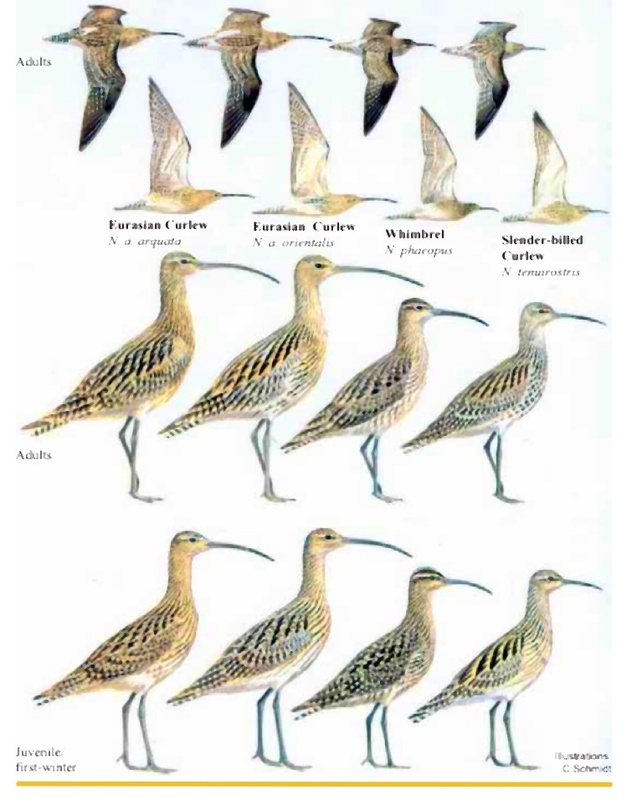 It may be under heavy interspecies competition with the much more abundant Common Curlew and f.e. Godwits. Probably they need a specific set of prepositions to breed, for example proximity to water; low, dense vegetation; temperature; undisturbance etc. which might be hard to meet due to human pressure. Meaby a specific breeding window exist, which can not be met because of prolonged migration flights. The species itself is described in the 1996 action plan as probably more tame than its congeners. The observational writings made in the nineteeth century state quite the opposite, a very shy, agile and easily disturbed species. Also this species is very hard to identify, and may be overlooked frequently, hence it is probably more common. Van den Berg writes it is very possible it has been overestimated and the numbers are lower than observations suggest. We, at PoB agree with him, a web search reveals many observations in current time, the vast majority with little substance. Does it still exist? We, at PoB, think yes. In the early nineties it was still encountered regularly. This is a long lived species (> 30 years) and many unconfirmed sightings have been made during the last decades, some of which might be true. Hunting pressure is much less now. Their known breeding habitat (in 1924!) has been completely destroyed, already since the sixties. The species moved to unknown places, decades ago. Luckily a species travelling vast distances, encounters many places. There is still hope, what do you think?